Almost ten months ago, I had the rare pleasure of trying the no longer available Ledaig 15 year. I LOVED IT! It was unique, odd but wonderful. With that official bottling off the shelves, I am left to get my Ledaig fix from the official older 10 year bottling (at 43%), the new 10 year bottling, a very young NAS release, and a bunch of independent versions. Because Ledaig is such an odd bird, I wasn't yet ready to dive into an indie release, especially not one with a quirky finish (read: Murray McDavid). Since the official 10 year is somewhat easily available in the States, I figured that was the direction to go. 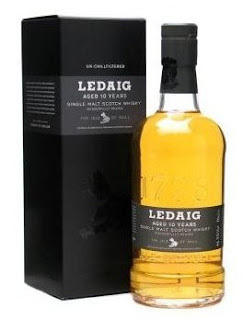 Ledaig (pronounced Lay-chig) is the peated malt from Tobermory Distillery, the only distillery on the Isle of Mull. Tobermory has modelled Ledaig after the original style of malt that they had produced for much of their existence. The peat levels are not shy on Ledaig, but it doesn't taste like an Islay, nor a Talisker, or a Highland Park, nor any of the peated Highlanders. It's its own beast, with characteristics ranging from barbecued fish, leather, vinegar, burnt citrus peels, tobacco, brine, to bacon. I know I loved the ol' 15yr. Would the newest version (at 46.3% ABV, not chillfiltered) of the 10yr provide a similar fun ride? Before going after a full bottle, I went for a 30mL Master of Malt sample. The color is very light amber. Somewhere between well-hydrated urine and pinot grigio. Think on that. No don't. The nose starts with cheap plastic toys, then peat-infused vinegar. There are some rubber bands, a light dose of American oak, a bit of vanilla. The palate holds bitter peat, wet dog hair (I obviously eat wet dogs on a regular basis), a ball of moss, simple vanilla, and maybe(?) sherry. It's young and spirity, yet easier on the tongue than the nose. It finishes with burnt paper, peat smoke, and that bit o' sherry. It stays youthful, hot and zippy and drying. Not much changes on the nose. More of the peat vinegar. And whole bunch of vegetal peat/moss. The plastic and rubber notes quiet down. The burnt paper note jumps into the palate, followed by old charred firewood, vanilla, moss, and some sour peat smoke. The finish shortens considerably. Still drying, though. All vanilla and peat smoke. The spirit shouts in this 10yr, while the oak whispers. I don't mind plastic and rubber notes in my whiskies, so keep that in mind. You many not feel the same. The sour and vinegary notes were all right, but not crazy or unique enough to be of note, nor something I yearn to taste in a daily dram. I would certainly drink this again, but I'm going to forgo the full bottle. It was an enjoyable Ledaig experience, but afterwards it vanished from my memory rapidly (and, no, I did not booze up afterwards). The old 15-year, though, remains in my memory ten months later. Hum... that doesn't bode too well for the bottle I bought, but I'll try to keep an open mind. And at least I paid a bit under the odds for it ($45 + free shipping). Good news is that you did get a great deal on it. Also, in my experience so far, whisky from the bottle can be better than whisky from the sample/mini. Never seen it the other way around. Plus you'll have time to grow into it. And it wasn't bad. Plus it's definitely unique. And un-filtered! I've seen both the 15 and the 20 recently. I was very tempted to purchase them both. Wow, the official versions?! Where are they hiding? I'm in Massachusetts, so it may be a long drive for you. And it was only one bottle of each in a little mom'n'pop liquor store. Although they did have a great selection of Gordon & MacPhail malts. Also, I was about to recommend to you that Ledaig 6yo from Murray McDavid you allude to, I had a bottle of it that didn't last very long and then replaced it - but since you didn't like the standard 10yo I won't. Don't take my word for it, I'm a sucker for Murray McDavid. Hey Florin! And I agree, when comparing it to the Islays, it would be closest to Laphroaig. I do like Ledaig quite a bit, though that 15yr may have spoiled me. Now that you mention it, I am intrigued to find out how MMcD's sherry cask would interact with the young crazy malt. I may start snooping around the indie Ledaig's in the near future. An elder whisky geek was listing the virtues of the Deanston 12 to me this weekend. I really like the Bunny 12 and I'll have to try Tobermory alongside Ledaig someday. Burn Stewart has some unique cool brands in their hands. I'm glad they're bottling them strong and un-filtered. Jordan, thanks for the tip, I'll check out AW. Michael, I did a more careful tasting of the new Deanston 12. It is a very well made whisky, and it has the most intriguing juniper berry notes - you'd swear it's a very nice aged gin, or a whisky-gin cocktail (now there's an idea for you, Jordan!) Very interesting, worth getting for originality alone. Thanks, Florin. I'll definitely give it a try. Burn Stewart's distributors have been pushing the Bunny and the Deanston pretty strongly in Long Beach and the nearby OC beach towns. I've been seeing those two in Whole Foods, Bristol Farms, and other upscale grocers around here. Sounds intriguing! Is it LAY-chig or lay-CHIG? I've been rolling with the latter. Though if I have a good glass of it, I go with LAY-CHIG. I'm listening to Ralfy's video review of Tobermory - at 3:54 he pronounces it Luh-CHAYG. It's a fun review altogether.